#1 Porter-Cable Oil Free Pancake C2002-WK Compressor Review! A subsidiary of Stanley Black & Decker, Porter Cable is acclaimed for producing some of the best power tools in the industry, and the PORTER-CABLE C2002-WK Oil-Free UMC Pancake Compressor is no different. Bundled with 13 different accessories, the PORTER-CABLE Oil-Free compressor power tool provides a modest 150 PSI worth of power, which is just enough for simple tasks such as filling car tires, finishing, nailer, cleaning and strong enough to power many pneumatic tools. Weighing in at a nifty 34lbs, the C2002 Porter-Cable Compressor offers superior portability, and is fitted with a well designed handle, which simply enhances its overall aesthetic appeal. Its compact footprint makes it a great choice for those who want a compressor that can perform a variety of simple tasks without compromising on valuable space. The 6-gallon capacity tank makes it perfectly suited for home use, but it is important to understand what this 150 PSI compressor is capable off. If you’re looking to power basic tools such as a nail gun, this compressor will definitely impress, but if your goal is along the lines of industrial use, it will fall short. This compressor is an oil-free tool, which eliminates any oil residue issues. Adding to this, it also helps avoid the need to add oil and the daunting task of checking oil levels. The regulator of the Porter-Cable Pancake Compressor is crafted of plastic, while drain valve of metal. Before you use the C2002-WK compressor, it is important to perform a break-in procedure (explained below), which is simple and will prevent serious damage. Overall the C2002-WK Pancake Compressor boasts a robust build, but is not shielded by a roll cage, making it unsuitable for industrial environments. Adding to its construction characteristics, the Compressor is equipped with a class leading induction motor, which delivers unmatched performance across the board. With the help of this soft start motor, the C2002 nail gun compressor can be connected with conventional household circuits and can accelerate at 3.5 SCFM for faster recharge of its 6 gallon tank. Unlike traditional motors, the motor of the Porter-Cable Compressor C2002-WK features replaceable brushes for longer service life and extended runtime. One of the noteworthy features of the C2002-WK Compressor is its 30 PSI “Bonus Air” and High-Flo air regulator to protect against significant drops in pressure. The onboard adjustable regulator allows you to simply program the delivery pressure depending on your needs such as using a nail gun, paint sprayer or replenishing air in your car tires. The C2002-WK tool also features two connecting points, which support not one but two users simultaneously. Before using the Porter-Cable C2002-WK nailgun compressor, it is important that you follow the break-in procedure, because failing to do so may result in premature failure and an expensive repair bill. 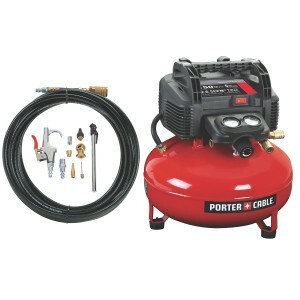 The Porter-Cable pancake C2002-WK compressor is a good choice for anyone looking to complete household tasks around the house from filling up car tires, powering nail guns, cleaning to even inflating the kiddy pool. Its price includes a handy 13 piece handy accessory set, making it an even better buy. Get new Nailer reviews as they come out by subscribing to our RSS Feed.